More than 100 million Americans tuned in to this year's Super Bowl, but scientists have released worrying new data suggesting that watching the game can leave viewers in a stupefied, immobile state. The study claims that watching a 3-hour game while eating the traditional feast of chicken wings, buffalo wings, potato chips, bastardized ethnic dips, mass-produced American beer, hotdogs, burgers, ribs, milkshakes and tacos leads to a severely reduced brain state in which sufferers are unable to answer basic questions, move, or go to the bathroom with any dignified level of success. 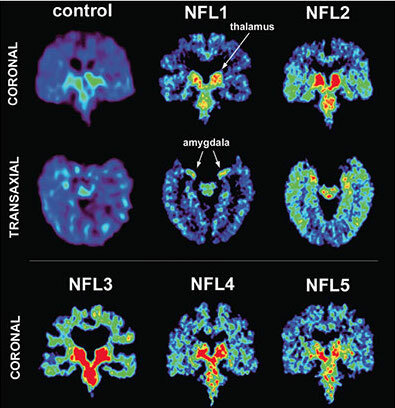 The diagram on the right shows in yellow and red the increased signs of brain damage as the game goes on, with NFL1 being the first quarter, NFL2, the second, etc. 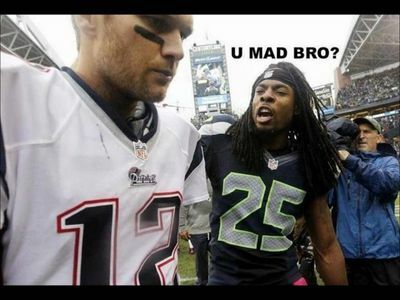 If the game goes into overtime, viewers will have the brain function of a masturbating zoo-held chimpanzee (NFL5). Such deterioration has been shown to seriously harm promotion prospects in most jobs outside of supermarkets. The news has been met with scepticism by many on social media, but study leader Joanna Corey told us: "Think about it, supposedly half the country watches this game every year, yet whenever you ask someone what the result was last year, they have a hard time recollecting even who was playing. "Go back two years and the figures drop even further. Our experimental group couldn't even recall basic facts about the teams involved until we prompted them with the U MAD BRO? stimulus." For fans of this year's runners-up, the news is even more grave. Corey has found evidence that some citizens in South Carolina are tragically deluded about the providence of the Carolina Panthers. "The most heartbreaking cases have been participants from SC thinking they are somehow represented by this team that plays north of the border. They resist even the most comprehensive evidence by repeating the mantra 'Two states, one team'. "Our current theory is that excessive guacamole consumption destroys the part of the brain that can distinguish between Charlotte, NC, and Charleston, SC."